The Palomar Knot is used to join a line to a hook, swivel or lure. The International Game Fish Association regards it as the strongest fishing knot known. That says a lot about this knot since there are a lot of knots used for fishing. Making the knot only takes a few steps. 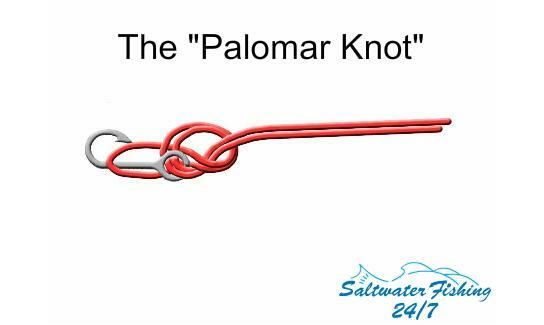 How to Tie The Palomar Knot -- The Palomar Knot is used to join a line to a hook, swivel or lure. The International Game Fish Association regards it as the strongest fishing knot known. Making this knot only takes a few steps. How to Tie the Offshore Swivel Knot -- The Offshore Swivel Knot is one of the strongest, if not the strongest, way to attach a swivel or snap swivel to a double line leader. It’s practically guaranteed never to break. How to Tie The Non-Slip Knot -- The Non-Slip Knot is logically named because it is designed to prevent slipping when attaching a lure to a line. This knot can be great for tying surface plugs, sub-surface lures like trolling lures to monofilament line. How to Tie The Nail Knot -- The nail knot is commonly used to secure two lines together that are of different diameters. It works great for attaching a leader to a fly line, and it is actually preferred over the Albright knot because of its smooth finish once it is done.